Where in the world shall you shop today? Hmmm. With so many ecommerce shops offering the unique and the ordinary from just about everywhere, online shoppers find themselves spoiled for choice. Let’s see, how about authentic escargot and perfectly ripe Camembert. For the Atlanta-based Frenchman hankering for a taste of home, delivery to his doorstep is only a click away. The vendor’s location doesn’t even matter. Some ecommerce shops import foods from afar, to offer online domestically. Others export exotic foods en masse as suppliers of special and exotic delicacies, accommodating B2B customers all over the globe. Still other ecommerce shops sell direct to consumers around the world. Of course, it’s not only ethnic foods on offer at ecommerce shops in foreign climes. Globally, clothing and other fashion-related items lead the way, followed closely by travel products or services. All ecommerce merchants face off against competitors, but not all demonstrate the personal touches that bring customers back. It may seem odd to say, but ecommerce shops’ personalities matter if merchants want international customers to become loyal patrons. We’ve discussed the importance of international payment solutions. 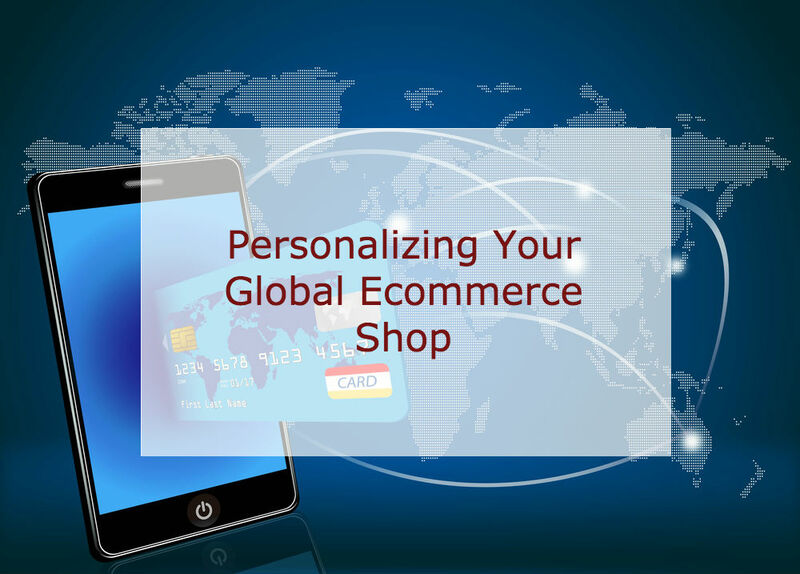 Now, let’s take a look at how to merge global ecommerce concepts with the personalization customers desire from your ecommerce shop. Online merchants are lucky, since a potentially global customer base is there for the taking. Well, it might be better said that international customers are there to be wooed and enticed to your ecommerce shop…if you engage with them the in the right ways. A quick Google search on “how to engage customers globally” returned more than 36 million results. Every consultancy, marketing, and retail advisory group shares information about customer engagement. While worldwide retail consulting experts may not offer services you need, you can learn from what they publish. Experts help merchants stay current on retail and ecommerce trends around the world. It may feel like a fool’s errand trying to understand the preferences of a diverse, global customer base. But retail experts at PYMNTS.com tout just a few “online marketplace features” that rank as most important to global consumers. Master these ways of doing business, and put your ecommerce shop ahead of your competitors. Free shipping. Yes, it can be expensive, but customers really love free shipping. If you can pull it off, you’re bound to attract new online customers who are notorious for comparison shopping online. Free (or reduced cost) shipping options result in lower cart abandonment rates too, which means more revenue for ecommerce shops. According to the “X-Border Payments Optimization Index” (the Index) from PYMNTS.com, 90% of the top-scoring merchants offer free shipping. Streamlined, short path for purchases. Think about how you can reduce the number of website pages and keystrokes consumers need to page through or enter to make a purchase. Streamline wherever possible. For example, be sure to provide the simple checkbox option to mark “billing address same as shipping address.” Carry the purchase amount (including taxes and any shipping cost) forward throughout the process, so consumers don’t need to page backwards to see it again before they buy. Customers appreciate such simple conveniences. Offer global accessibility features like multi-language and multi-currency support on your website. This falls into the category of “operate globally, engage locally.” Online shoppers want to access all of the products available worldwide. They also want to access them in their own languages and currencies, and to pay for purchases using their preferred payment methods. Top merchants offer six or more languages, and nearly eleven payment types according to the Index. Not all ecommerce shops intend to sell to every region in the world, so figure out where your customer base is, learn about their preferences, and be sure to offer those most important to your base. Seek and allow customer feedback, and share reviews when customers submit them. Global consumers want to know what others think, before they buy. As PMNTS.com states, “When trying to determine what customers want, it’s important for a merchant to let them speak.” The ability for customers to provide feedback is an important feature for ecommerce shops. And merchants need to understand their patrons. What better way to know what they like and dislike, and what frustrates them, than to ask? Seventy percent (70%) of top merchants do this according to the Index. Ask for feedback in the purchase and shipping confirmation emails you send too, and make it easy to reply by linking to the customer’s account. Create a globetrotter business to attract and engage with customers beyond your domestic borders. Take the time to learn about consumer preferences and online buying habits around the world to generate success for your ecommerce shop. One of the best ways to ensure your success is to work with a payments processor who understands the international payment solutions you’ll need to implement for your global business plans. Choose one who’s an industry expert, and that offers the right payments gateway to facilitate the international payment solutions. Give international consumers what they want, like multiple currencies and global card brand acceptance, so they become your customers. After all, the best way to attract and keep global customers is to know what they care about, so you can personalize your ecommerce shop and best your competition on the world stage. Choose MerchACT, where you’re more than an account number.